On August 12, 2018, at approximately 12:13 pm, Mono County Sheriff’s Office Dispatch was contacted by a pair of hikers in the Mount Ritter area. The female had lost her footing and slid 50 to 100 feet down a glacier on the south side of the mountain, colliding with the rocks below. She sustained head and facial injuries as well as lacerations to her extremities. All information was relayed to Madera County Sheriff’s Office as Mount Ritter is approximately 7.7 miles into Madera County. Madera advised that they would be using a helicopter resource to aid the victim. The victim and her partner were at approximately 12,200’ elevation on the south side of Mount Ritter. At approximately 6:30 pm, Madera County Sheriff’s Office Search and Rescue (SAR) contacted Mono County Sheriff’s Office SAR requesting a Mutual Aid response for a high angle/high altitude capable ground team to try to access the victim. Their helicopter resource was not able to contact the victim as the altitude was too great. The only assistance they were able to offer was to drop a survival kit, as they were not prepared for overnight conditions. Madera County Sheriff’s Office had a National Guard CH-47 Chinook Helicopter on standby for 8 am the morning of August 13. Madera County Sheriff’s Office also had a ground team driving through Yosemite to the Agnew Meadows trailhead to begin the trek to the victim as Mount Ritter is easier to access from Mono County. Mono County Sheriff’s Office SAR contacted Naval Air Station Lemoore for assistance, and they readily dispatched a Seahawk Helicopter to pick up a Mono SAR team at Mammoth Airport, with the intent to insert them as close as possible to the victim. At 9:10 pm, a team of (4) four Mono SAR personnel and gear was loaded onto the Seahawk to insert them below the victim. At 9:58 pm, the Seahawk was able to drop the SAR team at an elevation of 9,600’ approximately 1.2 miles from the victim’s location. moonless night sky. 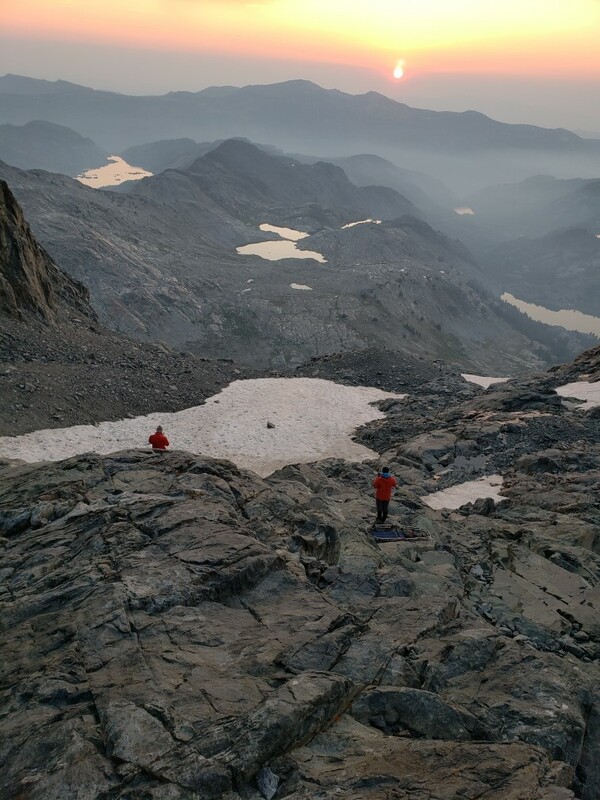 Come daybreak, Mono SAR members identified a suitable extraction zone and were able to move the victim down several hundred feet to the better location. 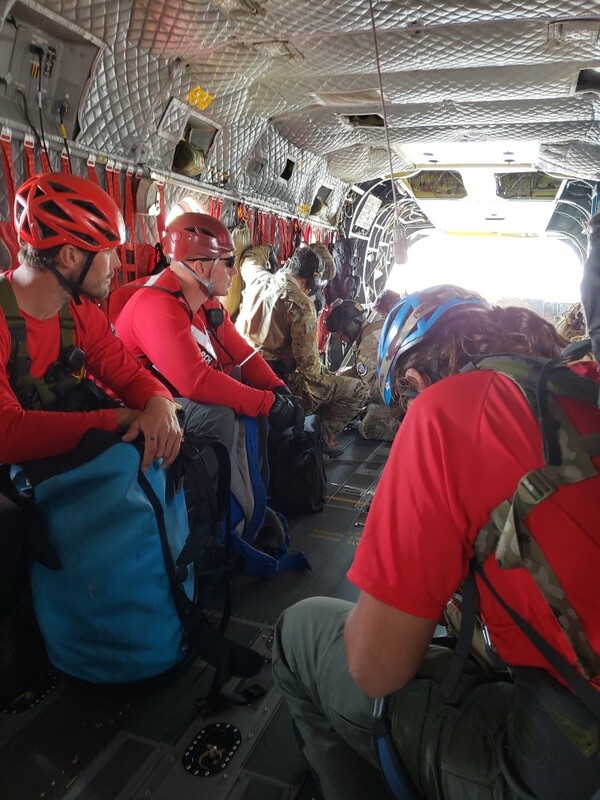 Madera County’s ground team arrived at Mono SAR base at approximately 1:20 am and was kept there until daybreak when an assignment was determined. At approximately 10:45 am, the CH-47 Chinook Helicopter with US Air Force Pararescue personnel onboard arrived overhead. The CH-47 conducted a rear wheels landing and loaded all 6 persons into the helicopter via the rear drop gate. 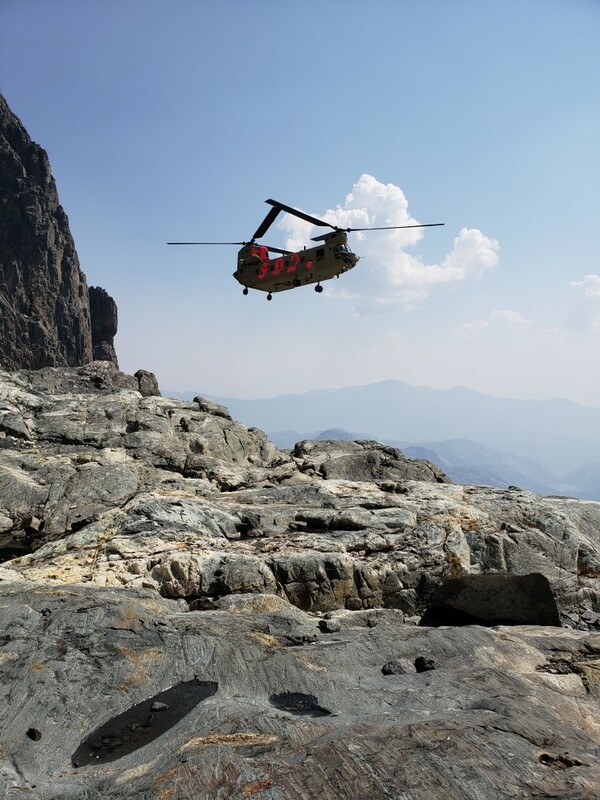 The CH-47 then flew the victim to Lee Vining Airport where they rendezvoused with a Care Flight Helicopter. The victim was loaded into the Care Flight Helicopter and transported to Renown Hospital. Mono County Sheriff’s Office SAR would like to extend a thank you to all the agencies involved including Care Flight, Naval Air Station Lemoore for the ride in and the California National Guard for the ride out. Again, it never ceases to amaze what strangers will do for others, even in the darkest of nights. The fall victim also displayed an incredible will to survive and maintained a positive and infectiously optimistic attitude throughout her ordeal.